Dubbed “the best player to ever put on the Cal basketball uniform” by head coach Lindsay Gottlieb, Anigwe boasts a resume to back those comments up. She finished 2018-19 as the nation’s top rebounder (16.2 per game) and shattered the Pac-12 single-season record for boards (533). On top of those dominating numbers on the glass, Anigwe averaged 22.5 points per contest and was named the National Defensive Player of the Year. 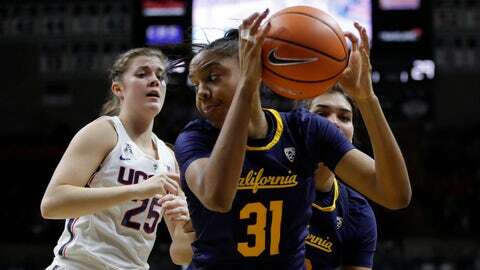 Another impressive feat: she became the first women’s basketball player to tally a 30-point, 30-rebound game in over 15 years during California’s 80-58 win over Washington State on March 3. Sheesh. If she’s available at No. 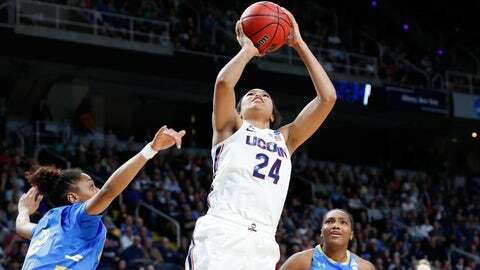 6, Anigwe could pair with Sylvia Fowles as one of the WNBA’s top frontcourts. Collier established herself as a double-double machine this season. Averaging 20.8 points and 10.8 rebounds per contest, Collier tallied 25 double-doubles on the year, including eight straight to close out her collegiate career. Using her elite skills in the post, Collier worked her way up to third in Connecticut program history in field-goal percentage. Really, the only weakness of Collier’s game is beyond the arc -- she knocked down just 15 3-pointers at a 28.3% clip this season. But her 6-foot-6 wingspan would play well down low in Reeve’s system. 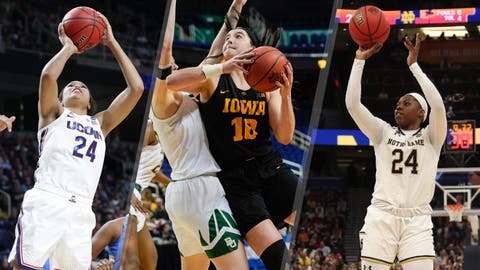 Named the Naismith Women’s Player of the Year in 2019, Gustafson posted monster numbers this season: an NCAA-best 27.9 points, 13.5 rebounds and 1.7 blocks per game while shooting 70.1% from the field. She’s also the only non-guard to post 1,000+ points in a single season in NCAA women’s basketball history. Like Anigwe, Gustafson could learn from the veteran Fowles and develop into a force in the post. You can’t talk about the Final Four without mentioning Ogunbowale. 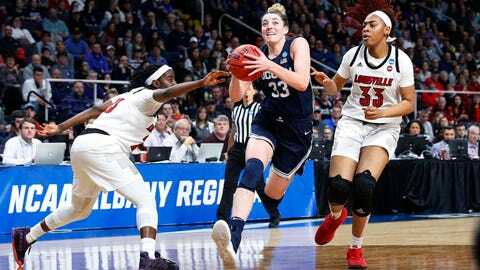 Named the NCAA tournament’s Most Outstanding Player in 2018, Ogunbowale knocked down two buzzer-beaters on college basketball’s biggest stage -- one to beat top-ranked UConn in the semifinals and another, just 48 hours later, to take down Mississippi State for a national title. This year was a different story, however. 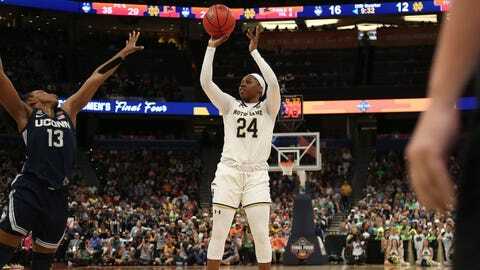 With Notre Dame trailing by two points in the 2019 championship game with 1.9 seconds remaining, Ogunbowale missed one of two free throws, and the Fighting Irish fell 82-81. Even the great ones miss. But there’s a reason the 22-year-old guard was trusted for Notre Dame’s biggest shots. She averaged over 20 points per game in her final two seasons and shot 39% from 3-point range over her collegiate career. With Moore sitting out this summer, the Lynx will need a scorer. And Ogunbowale is one of the best scorers in the draft. Moore, Breanna Stewart, Diana Taurasi and Samuelson. Those are the only players in Connecticut history to rack up at least 2,000 points, 600 rebounds and 400 assists in a collegiate career. What else do these players have in common? Taurasi (2009), Moore (2014) and Stewart (2018) all have won WNBA MVP awards. 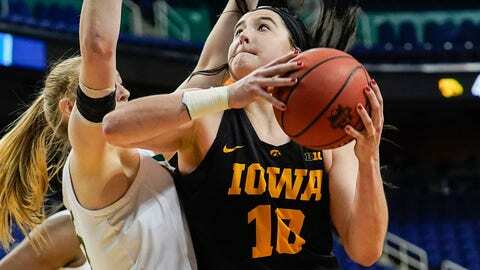 Samuelson has the talent to someday collect that hardware herself. With 382 career makes from downtown, Samuelson is the Huskies’ second-best 3-point sniper in school history. Her talent from outside would be welcome on the Lynx, who finished 11th out of 12 WNBA teams in both 3-point makes and 3-point attempts last season.